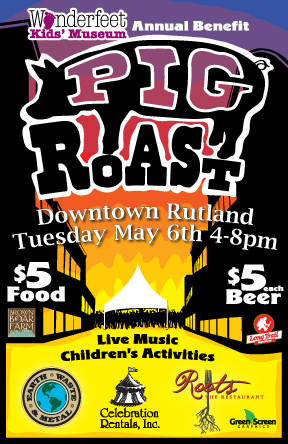 MAY 2014 – The Second Annual Pig Roast to benefit the Wonderfeet Kids’ Museum will take place on Tuesday, May 6, 2014 from 4pm to 8pm on Wales Street in Downtown Rutland. In addition to wholesome, naturally raised meat from Brown Boar Farm, prepared by Roots the Restaurant, the event will feature performances by local musicians as well as Cobra Dance Studio, and children’s activities provided by the Wonderfeet Kids’ Museum. The cost for the event is $5.00 for food and $5.00 per beer. There is no additional fee for the children’s activities. All proceeds from this event will benefit the Wonderfeet Kids’ Museum. Located at 17 Center Street, in Downtown Rutland, Vermont, the museum’s mission is to encourage children to appreciate their role in local and global communities by creating a dynamic environment which fosters curiosity and exploration, inspires creativity and engages the imagination through play. For more information about Wonderfeet Kids’ Museum, or volunteer information, please visit www.wonderfeetkidsmuseum.org. This Second Annual Wonderfeet Kids’ Museum Pig Roast is sponsored by Roots the Restaurant, Earth Waste & Metal, Green Screen Graphics, Celebration Rentals, the Long Trail Brewery, g.housen, Black River Produce and the Brown Bear Farm.